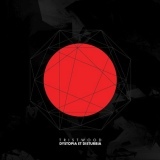 Following on from 2006’s interesting yet flawed The Delphic Doctrine, Austrian six-piece Tristwood have decided to make this, a heavier follow-up available for free download (link below) so there’s really no excuse for fans of Industrial extremity not to check this out. The band have an interesting if single-faceted sound, somewhere between Anaal Nathrakh’s all-out sonic warfare, Deicide’s intense blasphemy and Red Harvest’s apocalyptic misery, although the focus is always complete obliteration of the listener. This is pretty heavy stuff, even for Black Metal, constantly blasting and roaring, with more subtle riffcraft beneath – yet even more so than their last album, the focus here is brutality. Sparse touches of unaccompanied electronic, such as at the start of the opening title track, serve as introductions and breathing spaces, before the growling chaos of the music itself. Distant electronic backing and (apparently real but seeming programmed) blasting, with distinctive and diverse guitar and vocals atop seems to be the general formula, and it works for what it is. Raging and intense, there’s not a great deal of difference between the various tracks on initial listens, although some are slightly more memorable than others – Vulcanus being one, the coruscating The New Acid Bath another with its Strapping Young Lad feel. The more time you give the album, the better it gets. The band do have a slight issue in terms of songwriting, however – brutality is all well and good, but being able to channel that brutality into good songs would be much better. As it is, the most interesting thing about Tristwood is still the (now extremely mild) Eastern influence that filters in through moments such as the start of Irreversible, granting a welcome melodic overlay to the chaos. That track in particular is like a steroid-injected Behemoth, growled vocals roared out over a shifting musical tectonic plate of extremity. The vocal performances throughout are impressive, simultaneous growls and screams from two different band members working together wonderfully. I found the subtly electronically-enhanced screaming on Terra Incognita especially gripping, as is the track as a whole. Listen to this album as a whole, and it’s more than enjoyable as an intense piledriver – there was certainly more diversity previously, more room to breathe. This means that when you try and separate it into various songs, the cracks start to appear – Tristwood really do need to develop their songwriting skills in order to progress. However, it would be unfair to criticise them too much for this even if they were selling it commercially, as the primary purpose of the music is more than fulfilled. No death metal fan could listen to The Black Room’s channelled chaos and not be engrossed, whilst the black metal intensity of Chamelicon Bizarre will appeal to an entirely different crowd. Despite its faults, I more than recommend Dystopia Et Disturbia for those extremity-minded metalheads looking for an Industrial Metal album that doesn’t lack underground metal’s commitment to brutality. Given more time with it, I'd even score it higher.